Born and raised in Los Angeles, Tom’s (TV Jones stands for Thomas Vincent Jones) first encounter with the electric guitar was at the age of 14 and his interest led him on a passionate journey toward becoming a self taught musician and luthier. He continued to hone his craft into the late 80s/early 90s learning professionally at The World of Strings in Long Beach. It was around this time period that he would become known as a go-to tech for many players in the area and around the world. TV Jones Inc. was later founded in 1993 and was actually more of a custom guitar/repair shop. Tom’s interest in the Filter’Tron pickup arose from his association with guitarist Brian Setzer, whose guitars Tom has worked on since 1993. In 1998, Setzer chose Tom’s Hot Rod pickup design in a blind test of many different pickups for the new Gretsch Hot Rod guitar line. That moment launched TV Jones, Inc. into a lively relationship with Fender and Gretsch Guitars. Several months later, Tom became an independent consultant for the Gretsch Guitar Company designing pickups, guitars and more. ​While working with Gretsch, Tom continued to make and design guitars and his interest in guitar pickups grew. He became obsessed with finding the perfect tone and creating the best personality possible for each guitar he designed. 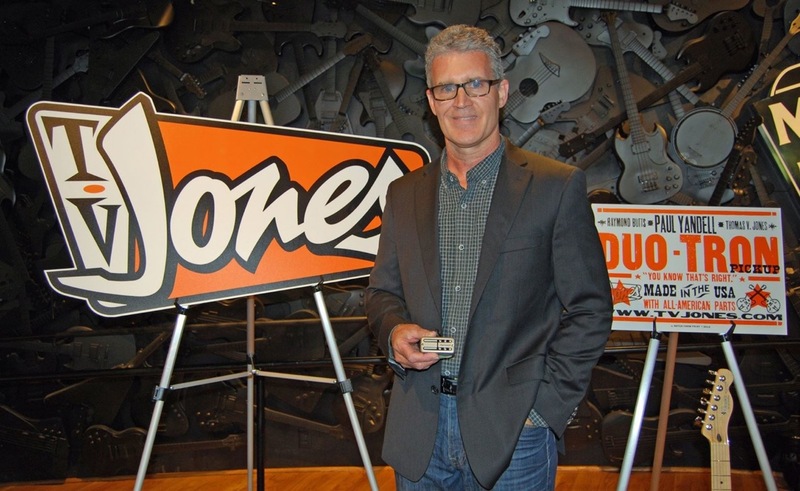 ​TV Jones Inc. continues to be a recognized leader in the development and manufacturing of innovative, high quality guitar pickups. We live by our original mission: To provide each customer with the finest guitars and pickups possible. We have analyzed the late ‘50s AlNiCo Filter'Tron magnets and reproduced them especially for use in our pickups. We found the original magnet manufacturer that supplied magnets for the actual vintage Filter’Tron pickups and deal directly with them. Our pole screws are custom manufactured to spec here in the USA. Different alloys and style of pole pieces (screws, blades, cylinder magnets) are used for different tonal variations. TV Jones bridge bobbins have a slightly wider pole-to-pole width to aid in centering the pole screws under the guitar strings in the bridge pickup position. Our neck pickups have a narrower pole-to-pole width. Most factory-made pickups have the same pole-to-pole spacing for the neck and bridge positions.